Channel Data Management Application: Build or Buy? - E2open | Demand. Supply. Delivered. 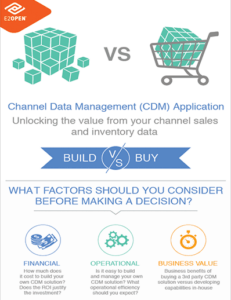 Channel Data Management Application: Build or Buy? The right Channel Data Management (CDM) system will unlock the value of your channel sales and inventory data. When deciding to build or buy CDM technology, how do the two stack up in terms of financial, operational and business benefits? This infographic makes it easy to compare the two.